Literacy Lessons™ is an intervention designed to reach young children (generally Grades 1-4) in special education or ESL settings who are struggling with beginning reading and writing but are not eligible for Reading Recovery. Specialist teachers in these two settings are trained to use Reading Recovery instructional procedures to design individual lessons for their students with the goal of accelerating their literacy learning. Children selected for Literacy Lessons are in the beginning stages of learning to read and write. They are identified based on the results of their assessment with An Observation Survey of Early Literacy Achievement. The theoretical base and teaching procedures for Literacy Lessons were developed by Marie Clay, the internationally known researcher whose pioneering work in early literacy is the basis of Reading Recovery. Like Reading Recovery, Literacy Lessons includes a strong professional development component, implementation standards and guidelines, and data collection. Literacy Lessons intervention specialists are educators who enter the Literacy Lessons professional development course as teachers certified/licensed in special education or ESL or bilingual education with experience and expertise in working with the population of their specialty. These specialists are seeking additional skill in helping students overcome literacy difficulties and develop effective early reading and writing systems. The preparation for Literacy Lessons intervention specialists is offered by an accredited higher education institution that has a Reading Recovery university training center. Initial training consists of graduate-level credit courses taught by a registered Reading Recovery teacher leader in consultation with the university training center. One training model involves 1 academic year of course work; the transitional model requires 2 years. The courses must meet the contact hour requirement of the credit-granting institution. For more information about training for Literacy Lessons, contact a university training center near you. Literacy Lessons is a research-based intervention. A key principle of operation is that data are collected on every student served. Data are used to determine the effectiveness of Literacy Lessons for students from special populations in special education and ESL. Data are also used in a formative way to increase the effectiveness of Literacy Lessons. 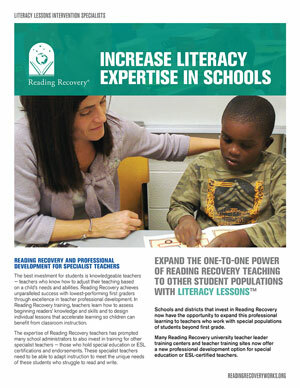 Literacy Lessons may only be implemented in schools that include Reading Recovery as an early literacy intervention. There are other groups of children who would probably benefit from the use of Reading Recovery teaching procedures. It is because these procedures are designed for adapting the instruction to the learning needs of individual children that they can be applied to many beginning readers who are in some kind of special education. And, because the procedures allow for accelerated progress, they are particularly useful for young immigrant children entering English, or Spanish, or French programmes for five- to seven-year-old children. Clay, M. M. (2005). Literacy lessons designed for individuals part one: Why? when? and how? Portsmouth, NH: Heinemann.